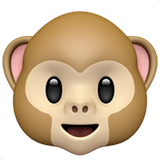 🐵 is an emoji depicting the face of a monkey. It was introduced with Unicode 6.0 in 2010. 🐒 is an emoji with a monkey sitting down with its tail curled up. It was introduced with Unicode 6.0.